Pups Spied: Dad Minds The Youngsters! What a fantastic surprise to see this sight a few days ago on one of my extended treks through our various Bay Area parks! 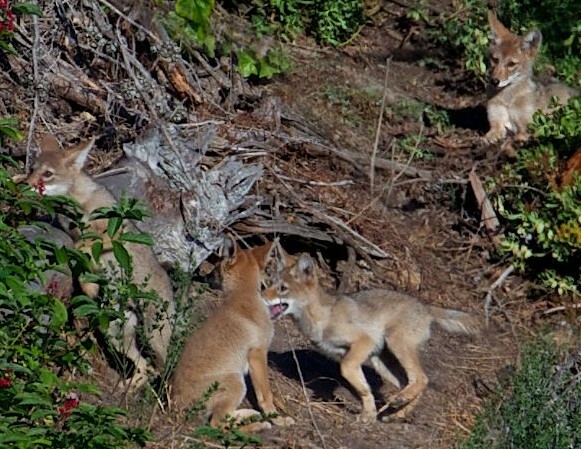 It looks like, true to reputation, coyote fathers spend their fair share of time minding the kids. Look hard, and you can see it’s the father. 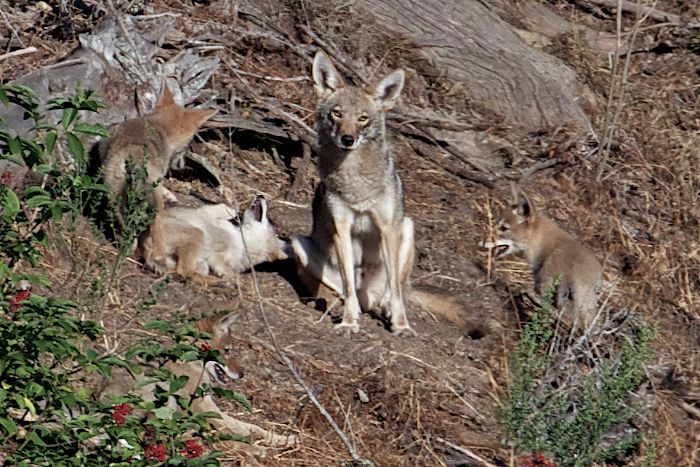 Here you see a papa coyote in charge of four youngsters. But fathers’ jobs include much more than childcare. Fathers keep pups fed by bringing them regurgitated food and small whole prey. And they also will help train them to hunt. Note in this second photo how one of the youngsters is pushing its snout into Papa’s: that is what normally elicits the reflux in the father — but it’s just play here. The kids here were pretty calm, while Papa sat there, ever so proud of his large brood. He saw me in the distance, and stayed there only long enough for me to get a few nice shots. Then he headed them into hiding and away from view. 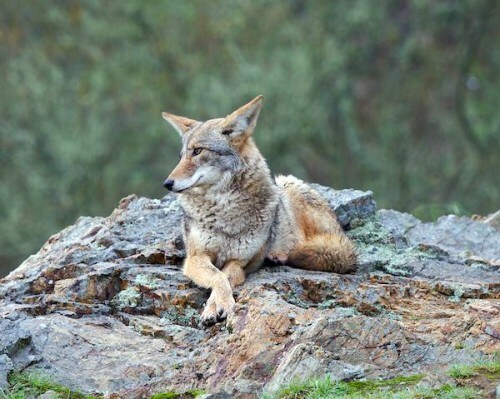 The updated presentation — updated on June 13th — is at the top of the page in the second posting on this blog: It’s called Coyotes As Neighbors: Focus on Facts. The version I’m posting today, here, in this posting, is called Coyotes As Neighbors: How To Shoo Off A Coyote. 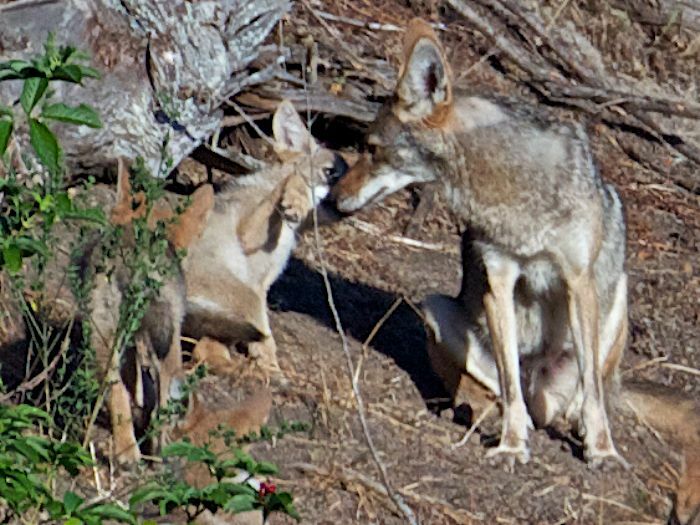 It is a shorter version of that first one: I’ve cut out some of the coyote behavior slides and the section on killing coyotes, and I’m concentrating on human and dog relationships to coyotes, and how to shoo them off in each instance. This version here is 20 minutes long, versus 30 for the one at the top of the Yipps blog. Otherwise, they are exactly the same. **PLEASE NOTE A PROTOCOL CLARIFICATION FOR WHEN WALKING A DOG (not addressed in the video): Your safest option always is all-out absolute AVOIDANCE: Whether you see a coyote in the distance, approaching you, or at close range, leash your dog and walk away from it, thus minimizing any potential dog/coyote confrontation or engagement. If you choose to shoo it away, follow the guidelines in the videos, but know that what’s safest is unmitigated avoidance. 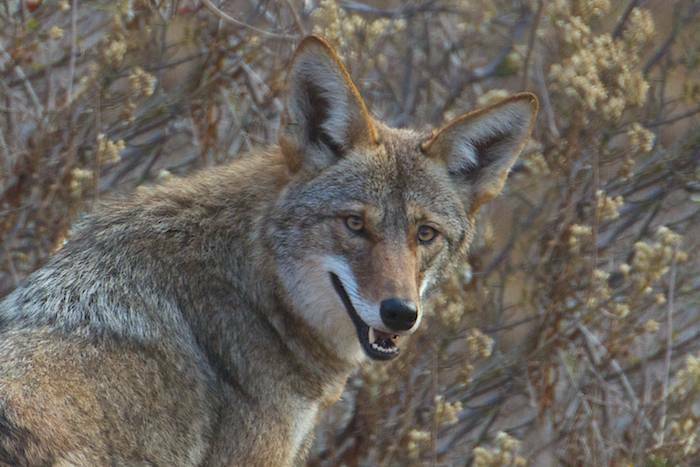 Shooing off a coyote should really only be used if a coyote is in your yard or if you do not have a pet with you and the coyote has come into your personal space. I don’t think a lot of the information in these videos can be found anywhere else — I don’t think much of this detailed urban coyote/dog behavior has been observed or documented — at least at the time I made this. 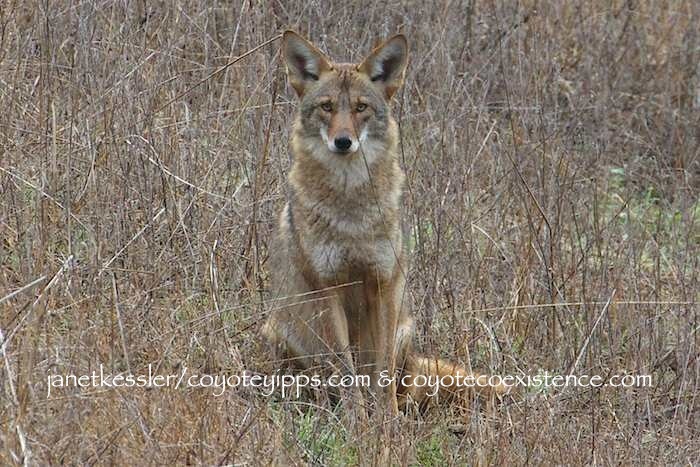 Except for some statistics and the section from F. F. Knowlton that killing coyotes increases their populations, most of the coyote information in these videos comes from my own years of first-hand observations. 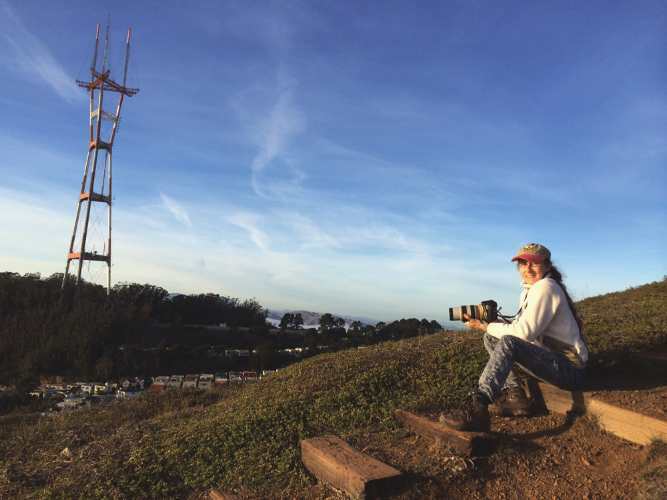 I spend 3-5 hours daily in our parks, engaging in my “pioneering photo documentation” (that’s what one journalist called it!) 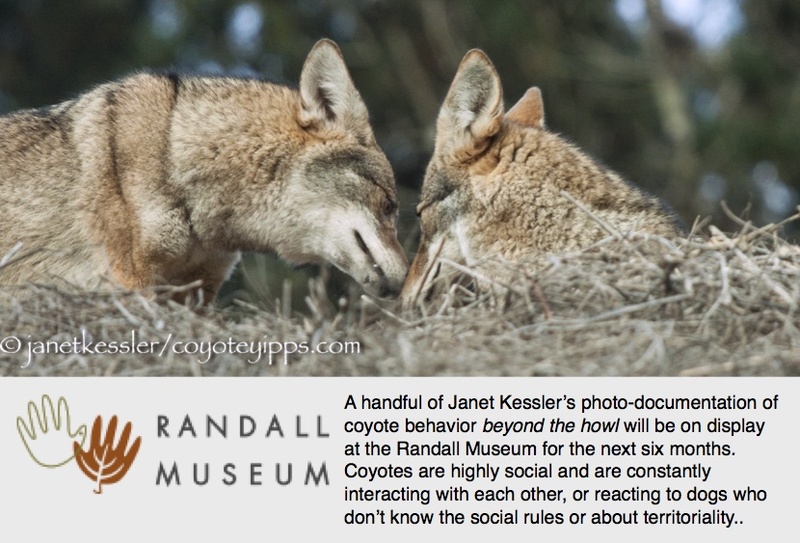 and research of coyote behavior and their interactions with people and pets. I believe these are the first such presentations which concentrate on the urban coyote himself! 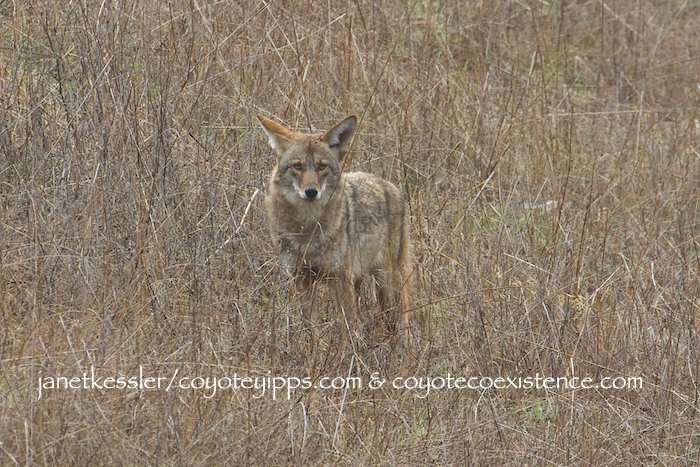 I’ve been told by coyote specialist professors that the dog/coyote observations are new. Anyway, I would like to to get the information out there now because we’re in the middle of pupping season — there might be more coyote encounters coming up. This information will be useful especially to dog owners. If you have time for the longer version, I recommend that one. If you don’t, try this shorter version. They are both pretty long, but they contain most information that you’ll need, especially if you are a dog walker.